Hello! I've been busy since my last post. Spring is here and I am in desperate need of clothes that fit! I gained a few pounds during the fall/winter and my current wardrobe is slowly dwindling as I pack up items that fit a bit too snug. I've been sewing for about two years now and I must admit that my projects have been all over the place. By that I mean, most of my projects cannot be worn to work aand cannot be mixed and matched with other items in my closet. So I decided to change that and focus on sewing items that can transition from season to season. I also want to make items that can be mixed and matched with other essential pieces in my wardrobe. Keep in mind, I am also trying to burn through this fabric stash to make room for future purchases. With that in mind, I set out to make something using a potting soil colored suiting fabric (purchased at Joann) that I have had in my stash for several months. I initially bought it to make pants but it never came to fruition. Fast forward to February of this year, when I came across a BCBG Generation sleeveless vest at my local Dillards. I really liked the style, knew it would be a perfect capsule piece, but refused to spend $100 on it. I decided I would make something similar to it. 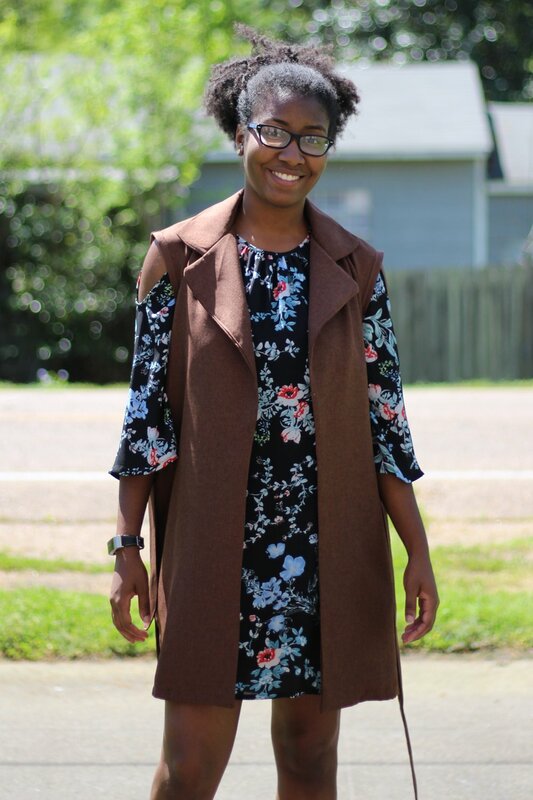 Lucky for me Simplicity patterns were on sale at JoAnn and S8554 was perfect for me to create a look similar to the BCBG vest. I also knew that this would a good opportunity to use the fabric sitting in the stash. Now for the pattern details. This is an easy to sew unlined jacket pattern. I cut the size 6. I did not want the length of View A but I also did not like View B Front overlay or View C sleeves. So I did the rational thing and combined features from each view. I went with View A overall look with View B length. Of course, I decided not to add the sleeve and finished the armholes with bias tape. The construction was straightforward but I wish it would have included steps for finishing the seams as you went along since it is unlined. I finished my seams with my pinking shears instead of the serger. Warning, the instructions to sew the jacket belt is incorrect. The pattern tells you to take one belt piece and fold it in half, lengthwise, then stitch a seam, leaving an opening to turn. If you do that you will end up with a really narrow belt and an extra belt piece. You should actually take the two belt pieces, place them right side together and stitch around the belt edge, leaving an opening to turn. I contacted Simplicity about the error. I used Pellon Fusible Ultra Lightweight Interfacing for the pieces that needed interfacing. I think this really helped cut down bulk in the collar area. I honestly had no problems with it and I am a total novice when it comes to collars. One collar came out shorter than the other but I just view it as a minor mistake in the grand scheme of things. I used double fold bias tape to finish the armholes, but in hindsight, I think I should have used single fold. My only dislike is the way the pockets puff when the jacket is closed. However, this could very well be my fault, I am not a perfect sewist. This jacket can be paired with a cold shoulder top or dress as pictured or with a light long sleeve sweater in early fall. I really do love it and it has been in heavy rotation since I finished it. I even included a second look below. Happy sewing!